Home > Belief > Who Killed Jesus is More Relevant than "Who He Died For"
Not too many years ago I would have acknowledged the solemn tribute that millions of people make each year on the “triumphant” day that is called Easter, which celebrates the supposed resurrection of Jesus Christ who, we have been told and admonished to believe, “died for our sins.” Now, I acknowledge the truth-loving, and truth-being spirit that is active in every human each day, as I continue the journey and process of delivering myself from deception, by honoring the Stillness within. The Easter story “worked” as a child, but now, this old, tired line of reasoning makes absolutely no sense. I AM an intelligent, reasoning adult human being to whom Life is a continuum of experiences, the scope of which is inclusive to, but independent of the body. Life creates form, expresses itself through form, but is independent of the form. The human body that we, Living Beings, express ourselves through while on Earth, is “on loan” to us from the Earth itself. It is the organic and inorganic “dust” that will, one way or another, return to soil after we refold into the Stillness (the Source of Life), to unfold (be born) again, perhaps “here,” or somewhere else. I DID NOT come from “Earth,” “ashes,” or “dust.” I WILL NOT return to “Earth,” “ashes,” or “dust.” That destiny applies only to the body that I express these thoughts through. A fundamental lesson of being human. For all humanity, experiences that are recorded while in motion “on Earth,” are not even limited to this planet, because consciousness is not limited to the location or limitations of the body itself. There is no reason to believe or assume that anyone is “from” any planet, simply because they motate “on” that planet now. We are not, and have never been, “the body.” I wrote a book on that very subject that any child you love should read, or be read to. Yet, billions of human beings on this planet have been so thoroughly conditioned to tie our very existence to, and define ourselves and potentials by the body, and to see each other as threats and enemies, that they have embraced, and often defend a much more odious deception as truth. The perpetrators of said deception represent a very tiny portion of the population. Pope Francis sends Easter blessings to gathered throng (2015). Religious pomp and circumstance promotes the mass suggestion that human beings (both believers and unbelievers), are “sinners” that exist in some form of probationary status with “God.” Interestingly, this point of view is shared in both Judeo-Christian and Islamic ideologies. Whether you believe that you are a “sinner” or not, the many and varied social systems that we have embraced, including banking, education, medicine, government, jurisprudence, military, media, science, communism, fascism, socialism, and democracy, treat you as though you are chattel property. You think they exist to serve (or protect) you (us) when they actually serve (and protect) someone else, neither you nor me. Our protector is nothing that is “outside” us, not even the gun. The Protector exists within each of us. Social systems influence and guide our thinking from which our experiences are created, away from that calm, still place. They would have us listen to their divisive voices instead of our own Insightful One. Experiences are fueled by belief, and changed by knowing. All exist as timeless thought before they exist as moments in time. A pretty busy deity “Himself,” we’re told that God — who most people do not know how to “see” and therefore question or fear “His” existence or “rule” — takes a “wait and see” attitude to determine whether we make the grade and receive “salvation” and spend eternity “with Him”. This all happens after reviewing our actions during this lifetime. The problem with that is, not convinced that what the religious leaders say is true, but just to be safe, we can spend a hapless lifetime on a competitive treadmill trying to curry “His” favor, mostly at the expense and often to the harm of other human beings. In the meantime, believers are advised to go to one of God’s agents to admit their “wrongdoing” (and according to them, virtually everything one can think of that is joyful, is “wrong”), and receive guidance. We’re expected to follow or heed a set of Commandments; told what we should and should not do, while a small faction of “leaders” (they’re not really, but that’s what we’re told), “lead” us into conflict, wars, enmity against others, subterfuge, espionage, poverty, and disease that they have fomented. I know that was a long sentence, but instead of breaking it up, please read it again, and especially let the last four words sink in. In order to have the best odds of getting God’s favor, we are invited to jump through the hoops that his agents suggest (which tend to have believers at odds with, fighting, or fearing each other), as well as to pay one tenth of our income to the religious organization so it can continue to “spread the word.” Said religious organization holds massive stores of riches and property, and is exempted from taxation on its real estate holdings and income. What a deal, eh? With all seriousness, the Christian story is that the omniscient, omnipotent, omnipresent God had just one “only begotten” son, and no wife. Then we’re told that Jesus “died” for sins we didn’t know about, except that the intercessor, preacher, or cleric, says it’s written “in the Good Book” and is therefore not to be questioned because the Book itself is the unadulterated truth of God. It is as though in all his powerfulness, God is incapable of telling us directly, so that there be no doubt. In what may appear to be an unrelated segue, I ask, what “sin” will a newborn have done to warrant being forced to receive drugs, in the form of vaccines, through the inertia of institutionalized medical practice? How is it that our society treats saying “no” to such barbarism as a “sin” against the system? You’d think vaccine programs were a plot to correct “flaws” in human design. Actually, they introduce them. Indeed, if such drugs were actually necessary (and they’re not), would that not mean that God made a big mistake in our creation? Or does it mean we, or someone are worshiping “false idols” (e.g., money, power, privilege), and have been doing so for quite some time? Why else would human Life be taking a backseat to disruptive, bio-antagonistic, pro forma conventions, and beneficial alternatives discovered, known and suppressed, that have been dictated by systems that purport to exist for our benefit? Getting back to Jesus, what about the people who killed him? If anyone did the sinning, wouldn’t you say it was them? Why are such insinuations directed at us, even today? Not our problem. Why is it that the only mantra we tend to hear uttered by religious middlemen, is that “Jesus died for our sins”? Why is so much less attention directed at who killed Jesus, and why they did it? Using my favorite search engine, I typed in the question, “who killed Jesus?” and got the following account in Wikipedia. Combining statements in the canonical Gospels, as is commonly done, produces the following account. Jesus was arrested in Gethsemane following the Last Supper with the Twelve Apostles, and then stood trial before the Sanhedrin (a Jewish judicial body), Pontius Pilate (a Roman authority in Judaea), and Herod Antipas (a Roman authority in Galilee), before being handed over for crucifixion. After being flogged, Jesus was mocked by Roman soldiers as the “King of the Jews“, clothed in a purple robe, crowned with thorns, beaten and spat on. Jesus then had to make his way to the place of his crucifixion. Both Judaea and Galilee were “client states” of the Roman Empire. Imagine all the sermons that have been preached on pulpits and podiums for hundreds to thousands of years, where Jesus was made to look like he was doing the faithful a favor by “dying”, with virtually no attention given to his killers. Why would someone want to kill Jesus? Judas Iscariot was said to have betrayed Jesus for 30 silver coins, but no one accuses him of killing him. Yet, historically, there appears more attention and enmity toward Judas than the killers. Accounts of Judas’ death are taking on the look of “cleanup” after a “hit”, such as that of Lee Harvey Oswald in the assassination of John F. Kennedy, or Building 7 in the 9/11 event. Did Jesus piss someone off who thought nothing of killing ‘a Jew’? Jesus’ clearing the temple of money changers. According to Wikipedia, Islamic texts, such as the Quran, dispute the claim that Jesus was crucified. It suggests, instead, that someone else was killed in Jesus’ place, which made it appear that he had “risen” after being spotted on the third day. Yet, that too, does not examine the question of who killed Jesus, and why. One source says he was a political rebel, in conflict with the “Scribes and Pharisees”. The more likely reason is money. I had already come to this conclusion when I found another article today. Illustration by Anthony Freda and Daniell Zollinger. It would make sense that whoever decided to have Jesus killed, was accustomed to making such decisions. That he was a Jew may have made it more important to “send a message.” The people who carried out the orders simply did what they were told, as they were accustomed. This suggests that both paths lead to Rome. The narrative of Jesus clearing the money changers from the Temple of Herod indicates a far more plausible reason why the “someone” who wanted him killed was connected to Rome. The official line has been that Jews put pressure on Pontius Pilate to kill Jesus. Even that doesn’t make sense because Pilate, who had no issue with Jesus, could likely care less about what the Jews, subjects of Rome, cared or wanted. Sorta like today. However, the Romans, forcible occupiers Israel at the time, very likely condoned, or were responsible for the presence and activity of the money changers in the temple. Someone in Rome had to be getting a cut from the proceeds. They likely wouldn’t tolerate a disruption, and would want to make a public spectacle to dissuade anyone else from getting such ideas. Jesus’ act, which according to a Jesus timeline, occurred around his 30th year, must have sent reverberations to Rome that, in conjunction with the other works that he would become known for, would eventually mean reprisals. Scribes and publishers of the day could “color” the history as they were told. Crucifying people was a Roman practice. 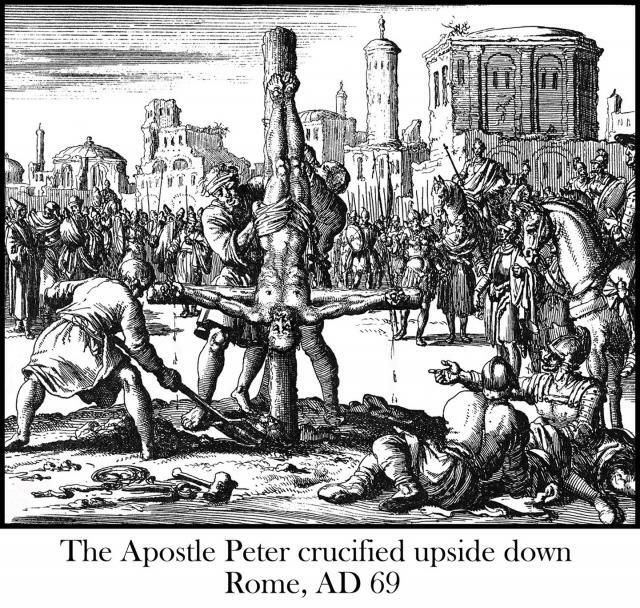 The apostle Peter was killed on a cross upside-down in Rome (by certain Romans), and later called saint, which the famous basilica in the Vatican is named after. it is cunning to blame Jews, who themselves were subject to Roman rule and law, for “killing their own.” It is much more likely that the killer, who chose, orchestrated, and controlled the very public manner of death, were ones with whom such practices were familiar, not only during that that time, but as time continued to advance. Looking at patterns of behavior, history shows eerily similar reprisals against people who disrupted “Roman” practices and agenda’s of their day. This is a very short list. Giordano Bruno (1548-1600) — insisted that the universe is in fact infinite and could have no celestial body at its “center” (much less Rome). He was convicted of heresy, and being at variance to certain Roman Catholic beliefs. As such, he was tortured for seven years by Roman Inquisitors, then burned at the stake. The writers of Bruno’s record speak of his torturers as “Inquisitors,” but someone issued the orders. Napoleon Bonaparte had a free hand in Europe as long as he borrowed money from the Bank of Rothschilds. When he quit borrowing, France was attacked by England. Andrew Jackson — vetoed the renewal of the Central Bank charter (1836), throwing out the central bank. Survived two assassination attempts. Czar Nicolas II and Family (1918) — executed during the Bolshevik Revolution as the idea of communism had been sent to infect Russian thought. This was payback for assistance given to America 65 years earlier. The Rothschilds order the execution by the Bolsheviks they control, and the murder of Czar Nicholas II and his entire family in Russia, even though the Czar had already abdicated on March.This is both to get control of the country and an act of revenge for Czar Alexander I blocking their world government plan in 1815 at the Congress Of Vienna, and Czar Alexander II siding with President Abraham Lincoln in 1864.It is extremely important for them to slaughter the entire family including women and children in order to make good on the promise to do so made by Nathan Mayer Rothschild in 1815. It is designed to show the world what happens if you ever attempt to cross the Rothschilds. On October 1, 1949, Mao Tse-tung (Zedong) declares the founding of the People’s Republic Of China in Tiananmen Square, Beijing. He is funded by Rothschild created Communism in Russia and also the following Rothschild agents: Solomon Adler, a former United States Treasury official who was a Soviet Spy; Israel Epstein, the son of a Jewish Bolshevik imprisoned by the Tsar in Russia for trying to foment a revolution there; and Frank Coe, a leading official of the Rothschild owned IMF. On June 4, 1963, President John F. Kennedy (the 35th President of the United States 1961 – 1963) signs Executive Order 11110 which returned to the U.S. government the power to issue currency, without going through the Rosthchilds owned Federal Reserve.On November 22nd, less than 6 months later, president Kennedy is assassinated by the Rothschilds for the same reason as they assassinated President Abraham Lincoln in 1865. He wanted to print American money for the American people, as opposed to for the benefit of a money grabbing war mongering foreign elite.Executive Order 11110 is rescinded by President Lyndon Baines Johnson (the 36th President of the United States 1963 to 1969) on Air Force One from Dallas to Washington, the same day Kennedy was assassinated. Another, and probably the primary, reason for Kennedy’s assassination is however, the fact that he made it quite clear to Israeli Prime Minister, David Ben-Gurion, that under no circumstances would he agree to Israel becoming a nuclear state. They financed [Leon] Trotsky’s mass meetings of discontent and rebellion in New York. They paid Trotsky’s passage from New York to Russia so he might assist in the destruction of the Russian Empire. They fomented and instigated the Russian revolution, and they placed a large fund of American dollars at Trotsky’s disposal in one of their branch banks in Sweden, so that through him Russian homes might be thoroughly broken up and Russian children flung far and wide from their natural protectors. They have since begun the breaking up of American homes and the dispersal of American children. Even though the names changed over the centuries, the behavior that resulted in Jesus of Nazareth being crucified on a cross, if it happened at all, for which “his own people” were blamed, is much more in alignment with subsequent similar reprisals, and subversive diversionary tactics, for related actions that could likewise be traced to elements in Rome. Jesus would have been one of many who had not “sinned” to be murdered by others who still are. Yet, we naively and childishly romanticize Jesus death and cast a blind eye toward his killers, their motives, and modus operandi. The relevance today, is that we’re still doing the same thing. People who have not “sinned” are being “written up” and “charged” for infractions dreamed up by clerics, mindless bureaucrats, “confirmed” by controlled $cientists. They are dumbed down a bit more just before entering school, and taught to conform and think as they are told. Their natural genius is not valued, except if it can be used to secretly maintain a “superior” competitive or adversarial position. Innocent people get sick from faux food and beverages that are pushed on us from all directions, and from vaccination policies that alter a naturally healthy blueprint just new life is getting started. Then when the alterations reach critical mass, months and years down the line, they hit people with more disruptive modalities — ALL AT ASTRONOMICAL PRICES — that do not help restore health, but hasten one’s demise. Amazing in all this is how obvious it is, and how many people don’t see it. Jesus said that the things that he did, we would do likewise, and greater things still. Right now what innocent people like Jesus, are doing except don’t know, is being dumbed down, poisoned, exploited, instigated into war, and killed by heartless institutions that they trust. Whether he was a historical figure or not, the message and model of Jesus was Love. It was harmony and peace. It was respect for ALL. It was ONENESS, not only with “The Father,” but each other. That ONENESS was not something that needed to be accessed or known after the life was over, but NOW, HERE. Don’t say “No” to War. Say yes to Peace, starting with, and within yourself. You need no one else’s permission to do so, but your own. Don’t try to make peace, be peace, even amid chaos. And watch your love view and world view change. Not to change the focus entirely, but the context shifts in the light of Joseph Atwill’s ground-breaking book “Caesar’s Messiah” (highly recommended). Atwill shows the strange concordance between the New Testament “Gospels” and the official Roman histories of Flavius Josephus. Unless Atwill’s well-buttressed conclusions are mistaken, the story of Jesus was a creation of a literary team working for the Flavian emperors to control the plebeians of the Roman Empire. Extremely ironic that the “perfect exemplar of love” was likely concocted as a tool for the mind control regime Adam is writing about.